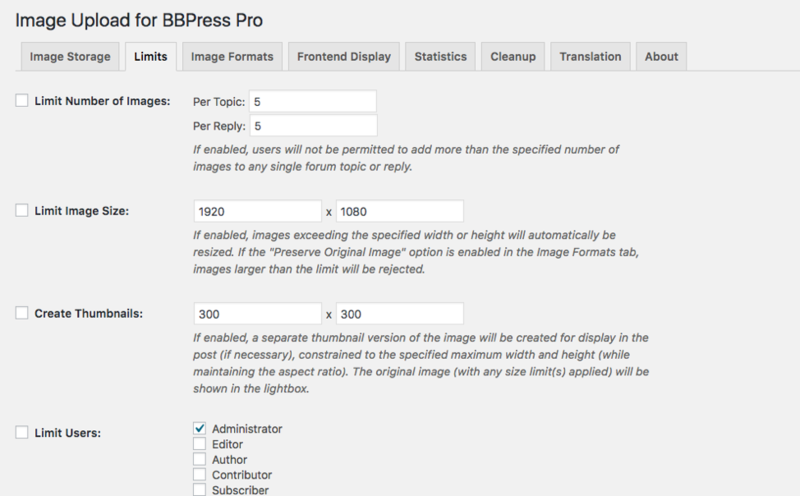 Helping WordPress websites offer a visually striking component to their bbPress forums, the Image Upload for bbPress Pro WordPress Plugin allows forum users to include inline images into their discussions on bbPress forums. 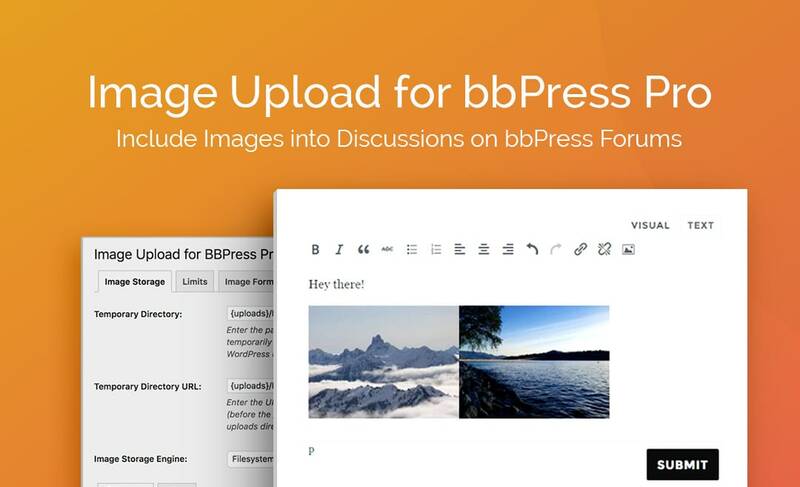 With the Image Upload for bbPress Pro WordPress plugin activated, site visitors can insert images into their topics and replies on bbPress forums using an easy-to-use drag and drop image uploader. Images can be automatically resized to save storage space and bandwidth and enlarged when clicked with a built-in lightbox. The Image Upload for bbPress Pro WordPress plugin also allows site visitors to insert images using their mobile phones. While in the forum post editor, the site visitor can simply tap a button on the screen to bring up the Upload Image box, where tapping the screen a second time will bring up the smartphone operating system’s image selection options. Includes a responsive drag-and-drop image uploader with support for inserting multiple images at once. Generate and insert separate thumbnail versions of uploaded images while retaining a larger version for use with the built-in lightbox. Allow users to upload animated GIFs while preserving animation. Change the directory where uploaded images are stored. Limit which user roles are permitted to upload images. Limit the number of uploaded images allowed per topic or reply. Automatically downsize images to fit specified maximum dimensions. Convert all uploaded images to the same image format, if desired. Set PNG and JPEG compression levels so images take up less disk space. Allow users to view enlarged images in a lightbox by clicking on them within the post. View total image count and file size statistics. Optionally, use Amazon S3™ to store and serve uploaded images in submitted forum posts (requires add-on plugin purchase). 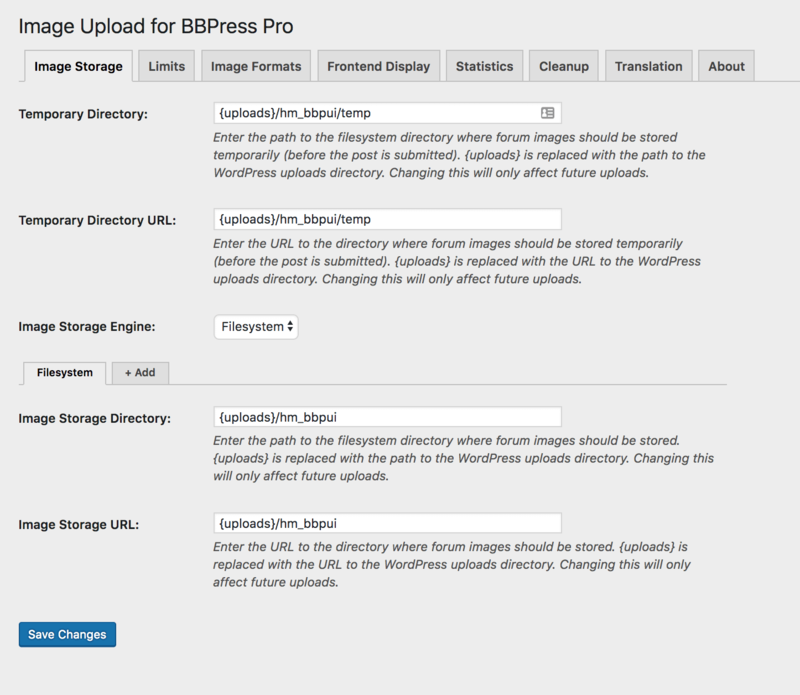 The Image Upload for bbPress Pro WordPress Plugin integrates seamlessly with the WordPress aesthetic. 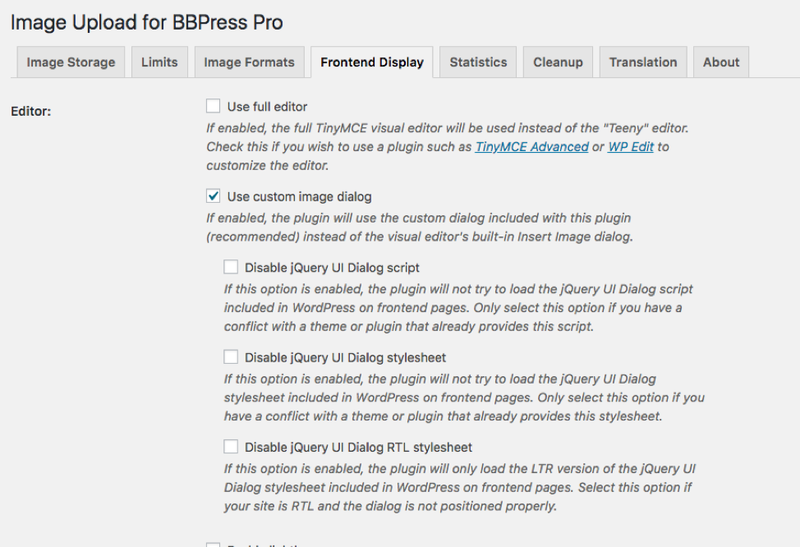 After installing and activating the plugin, Image Upload for bbPress Pro WordPress Plugin creates its own menu item in the WordPress dashboard which links to a page that allows site managers to configure a variety of options for the plugin. 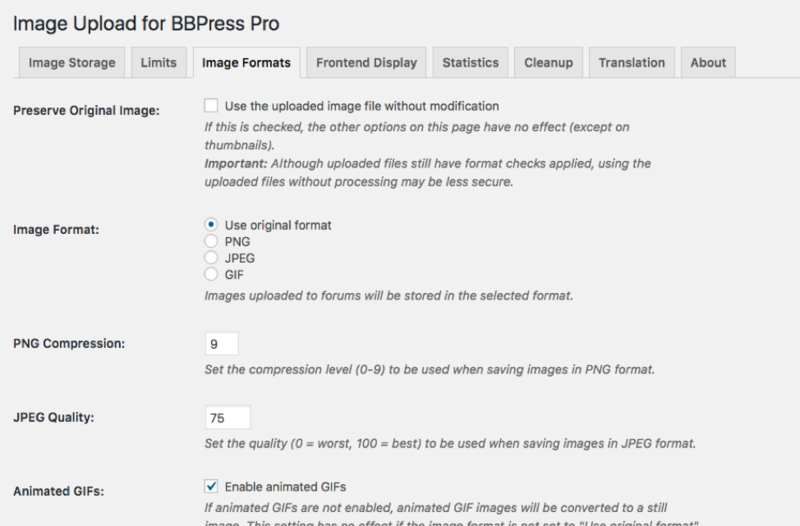 Settings for the Image Upload for bbPress Pro WordPress Plugin are organized into a number of tabs, making it easier to locate configuration options for the plugin. In the Image Storage tab, the user can set the folder on the server where the images will be stored. With the purchase of the S3 Image Storage for bbPress add-on plugin, settings for Amazon S3™ image storage can also be configured in this tab. In the Limits tab, the user can decide a number of restrictions for the images, such as limiting the number of images uploaded per topic and per reply. The user can also set the maximum file size and dimensions for uploaded images and optionally specify dimensions for thumbnails, which includes automatic resizing for both. In the Image Format tab, the user can select which image formats will be used for storing images uploaded to forum posts using the plugin. The user can also specify compression settings and decide whether they’d like to allow animated GIFs to be uploaded. In the Frontend Display tab, the user is able to set variables relating to how the plugin will display for the site visitor, such as whether the full TinyMCE editor and the custom image dialog that comes default with the plugin will be used. Also in the Frontend Display tab, the user can decide whether images will open in a lightbox. By default, the Statistics tab shows the total number of images that were uploaded with Image Upload for bbPress Pro and are currently stored, as well as the total storage space being used. Finally, the Translation tab lets the user set alternate text for default labels in the frontend of Image Upload for bbPress Pro. 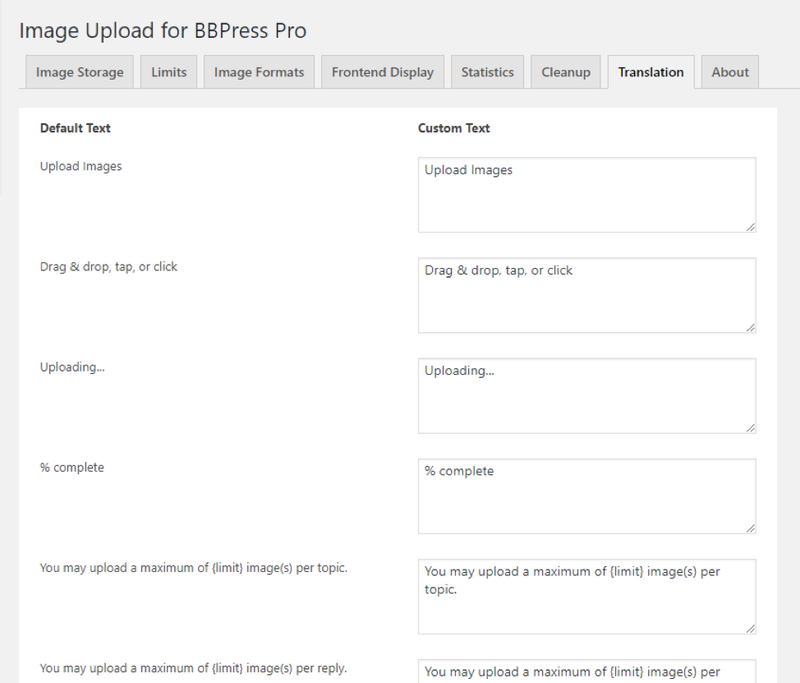 Please note: The screenshots are from version 2.1.13 of Image Upload for bbPress Pro. For the latest feature list update of version 1.0.1 please refer to this blog post.